According to the current version, Thor's history follows the traditional myth and later on, he abandoned his worshippers in disgust when they massacred a Christian mission; although he has been seen in flashbacks to have befriended many of his followers and personally guaranteed their passage into Valhalla, he and his other Asgardians have abandoned their roles as figures of worship. Much later, his father Odin decided that Thor had to be taught humility, and so transformed him into Donald (Don) Blake, a human surgeon who was lame in one leg, and erased his memory. For years, Thor played the role of Don Blake who was a brilliant physician and lived upon Earth. Subsequently, Don Blake became Thor's human alternate persona. Eventually, Odin was satisfied that Thor had spent enough time as Donald Blake, and became Thor with no mortal trappings. However, in Thor's first appearance (as shown left), long before the lifting of that spell, Odin planted a subconscious desire to go hiking in a specific wilderness area. Once there, aliens attacked and trapped Blake in a sealed cave with little hope of escape. Desperately, Blake tried to use a walking stick he found as a lever to remove the blocking rubble. When he struck the rocks, he triggered the special change spell of the stick and Blake was transformed into his true form of Thor and the stick became the uru war hammer Mjolnir. With his rediscovered power, he escaped the cave and defeated the aliens. With that, Thor dedicated himself to fighting evil. Thor battles enemies such as his adoptive brother Loki, who has sworn to kill him. 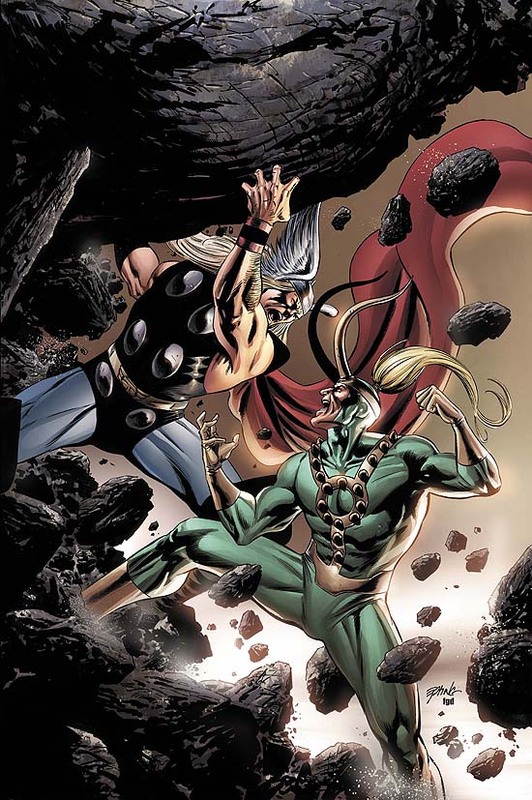 To that end, Loki created powerful minions like the Absorbing Man and the Wrecker and manipulated other enemies like Ulik of the Trolls to challenge the thunder god; one of these manipulations resulted in the formation of the superhero team called The Avengers, a team in which for years Thor has served as one of the core members. At the same time, Thor had a romance with his (Donald Blake's) nurse, Jane Foster, which Odin disapproved of; that attitude proved a source of constant frustation for Thor, who at one point even unsuccessfully appealed to Odin to allow him to bring Foster to Asgard. This status quo in the comics was shaken up in the 1980s under the authorship of Walt Simonson, beginning with Thor's encounter with the monsterous yet noble alien called Beta Ray Bill. Thor was sent to encounter Bill at the request of S.H.I.E.L.D., who had observed Bill's ship destroy a star to refuel; S.H.I.E.L.D. feared that the ship might do the same to the sun. During the subsequent fight, Thor lost contact with his hammer for too long, causing him to revert to Blake. Ignorant of the hammer's power, Bill picked up the cane and struck it in frustration against a wall, enacting its mystical enchantment. Being judged worthy to hoist Mjolnir in the process, Bill was transformed, gaining Thor's power (and a variant of Thor's costume) for his own, before being summoned to Asgard by Odin, who confused Bill with his son. Upon realizing his mistake, Odin retrieved Thor as well. Bill claimed Mjolnir as a prize of fair combat, which Thor — being disadvataged by his reversion to Blake — naturally disputed. Odin had the matter settled by trial by combat in the volcanic World of Skartheim, "where even gods may perish." Bill won an evenly matched fight due to his distinct biological make up that caused the heat from the volcanic world to revive him. Though Bill's ability to defend his people would have been greatly aided by Mjolnir's power, he did not feel it was right to claim a hammer forged for Thor. On hearing this, Odin worked out a compromise for the equally worthy warriors, with Bill receiving a close copy of Mjolnir called Stormbreaker and transferred the transformation spell to it so that Bill — whose altered form he despised and made him, essentially, a pariah to the people he had taken it to defend — could enjoy his original form when he wanted it, while Thor finally abandoned the Don Blake identity. Sif, who had become depressed and estranged from Thor, left with Bill. Soon afterward, the fire-demon Surtur would forge his sword, Twilight, and march on Asgard to light it with the Eternal Flame, with the intention of bringing an End to Everything. Odin summoned all of Asgard's warriors to the battle, including Bill and Sif. Loki was the only one not to respond. The armies of Asgard then left for Earth, to prevent Surtur and his armies from crossing Bifrost, the Rainbow Bridge. Having set light to New York though, Surtur tricked Thor into drenching the city in a rainstorm to extinguish the flame, creating a rainbow for a brief moment as he cleared it, allowing Surtur passage to Asgard, who then shattered Bifrost behind him. Thor teleported himself to Asgard, leaving Bill in charge of Asgard's armies in the fight that still raged on Earth, but Sif was stopped by Bill from following. Enraged, she lept further into the battle, vanishing as she fought a rearguard action. The rest of the army, aided by the Avengers, Fantastic Four, and the Norn Queen's army, destroyed the portal Surtur's army came through, returning them to Muspelheim. ...to find nothing happened. He turned to find Loki taunting him over falling for such an illusion. Loki bought enough time for Odin and Thor to recover, then the three attacked Surtur in concert. Thor, realising just how much of Surtur's strength came from Twilight, managed to knock it from his hand, and Odin knocked the demon into Muspelheim, pledging to prevent Surtur's return as he fell with him. In the aftermath on Earth, Sif was found badly injured, but recovered quickly with the help of the Asgardians' healing techniques and teleported to Asgard to find Odin gone and Thor as emotionally shattered as the remains of the Rainbow Bridge. He bade her to return to Earth and co-lead Asgard's warriors with Bill, until a way could be found to return them to Asgard. (Due to Bifrost's shattering, only Thor, Sif, Bill and the Enchantress were able to move directly from Earth to Asgard), while Thor left for the mountains to grieve. After his rescue from a Hela-engineeered avalanche by Tiwaz (unbeknowst to Thor, his great-grandfather Buri), he remained with Tiwaz at his insistence until he was recovered. After, by the combined powers of Thor & Bill's hammers, the Asgardians were returned to Asgard to find Odin gone, Thor declined to take the throne that was his birthright, instead passing the regency to Balder the Brave. Eventually, Odin was found, imprisoned by Seth, the Egyptian god of death and, with a few hiccups, remained the Lord of Asgard until his recent true death. Thor inherited the Odinforce. With his human side separated into another vessel, took the throne and began to rule Earth with an iron fist. His rule lasted for 200 years, until his son, Magni, finally convinced him of the wrongness of his actions. Thor returned to the past and gave his 200 years of memories to his younger self as a warning, before rejoining him with his human side, who then returned the Asgardians to the true Asgard. This situation would not last long, however. The Odinforce had become sentient and, appalled by what he saw in Thor's memories, left him. In addition, Loki recovered the Mould of Mjolinr and raised Surtur, who agreed to make new hammers using it as repayment for his return to life. Loki and his followers then proceeded to devastate Asgard, killing several and shattering Mjolnir in their first attack. Ragnarok was upon Asgard. Gradually, more and more fell until a desperate retaliation, aided by the return of Bill, stemmed the tide. Thor placed Bill in the leadership of Asgard, while he, followed by the Odinforce in the form of a child, underwent the trials Odin undertook as a young man, only more so: Thor sacrificed both his eyes for knowledge (Odin had lost only one eye) and spent a week dead hanging from Yggdrasil to gain the wisdom of the runes. At the end, he saw that the Ragnarok cycle was caused by the leeching of a group of self-styled "Gods to the Gods," known as Those Who Sit Above in Shadow, who depended on the Ragnarok cycle for their survival. Appalled at the thought that the Asgardians' sacrifices meant nothing, bolstered by the human side that was his birthright from his mother, and strengthed by Odin placing him in the Don Blake identity for years, Thor resolved to end the cycle at ANY cost. His sight (though not his eyes) restored by the return of the Odinforce to him and the runic magic, Thor single-handedly devastated Valhalla, where the victorious Loki now resided. Thor separated Loki's head from its body, attaching the still-living head to his belt. Thor then did the unthinkable, making a deal with Surtur: in return for the reforging of Mjolnir (he felt it appropriate for Surtur to be the one to remake it), he would blast a clear path for him to Asgard. The final battle unfolded, with Thor's only part the return of Beta Ray Bill to the Earth dimension. (Feeling that a non-Asgardian had no place dying in his race's final battle, Thor bade Bill to remember them.) When all lay dead, and Fenris had consumed the remains, Thor shattered the Fates' weave to prevent the cycle's continuation. Finally, uncertain of his future, he decided to "sleep the sleep of the gods." Thor is the Norse god of Thunder, Lightning and Agriculture. As such, he controls storms, particularly rain and accompanying wind and thunder, as well as base elements. Thor also possesses enormous strength, stamina, and endurance. Thor is immune to all terrestrial diseases due to his god-like physical constitution. He is a superb hand-to-hand combatant, even against other Asgardians. In fact, Thor is known to be one of the strongest of all Asgardians, possessing "Class 100" strength (The ability to lift/press well over 100 tons over his/her head.). This strength level makes him physically in the same strength-class as The Hulk, Juggernaut, Gladiator, Hercules and a few others. He is very cunning and intuitive in battle, and what he lacks in genius he makes up with experience. Thor's uru hammer, Mjolnir, amplifies Thor's innate control over the elements and can be used as a missile weapon by throwing it (which in return allows the hammer to return in mere moments, unless seized by others. This normally fails as few are worthy to weild it). Thor can also generate mystical blasts of unknown origin from Mjolnir, as well as magnetic and gravitional fields. Through concentration, Mjolnir can be utilized as a siphon to drain nearby sources of energy and magic, allowing Thor to rechannel these energies into energy blasts to either supplement or increase the energy blasts of Mjolnir. The hammer also allows him to travel between dimensions and points in space by creating gateways and can also allow Thor to fly by grasping the handle of Mjolnir after throwing it (extremely long distances are covered through a teleportational gateway). Thor can also use the hammer to drain energy from both humanoids and machines. He has used the hammer to channel such energy into an attack in the form of a mystical blast. Thor can also use the hammer to channel his own "godly essence" resulting in a massive and devastating attack called Unfettered Might and the God-Blast. The hammer is mystically enchanted so that only those of worthy character can wield it. Throughout the last 40 years, Thor has been a somewhat important Marvel character, although writers have varied in the degree of actual Norse mythology they implemented into the character's series. Marvel Comics' Thor is blond and usually clean-shaven. The Classical Norse version has red hair and a red beard. Thor wields Mjolnir without aid. The Classical version needs his belt and gloves to wield Mjolnir. In the classical Norse stories, only Thor and his son Magni can lift Mjolnir. In Marvel, only those worthy can lift it, which is a small list of people that includes Captain America (at the time simply called "The Captain"), Beta Ray Bill, Thunderstrike, Odin and his grandfather Tiwaz. In crossovers with DC Comics, Superman and Wonder Woman were worthy to lift Mjolnir in Avengers/JLA #4 (2003) and Marvel vs DC #3 (1996), respectively. In the Marvel Comics Universe, Thor was a bachelor without children. In the classical Norse myths, his wife was called Sif and they have two children, Thrud and Modi, and a stepson called Ullr. With Jarnsaxa, Thor had the son Magni. In the Marvel version Sif became a lover of Thor's. In the classical Norse myths, Thor will kill and be killed by Jormungand at Ragnarok. In Marvel, Thor kills Jormungand and survives, as he was then cursed by Hela to be denied the gift of death. Giving Thor's lover, Sif, black hair. In myth, it was spun out of gold as a gift by Loki. In Marvel Sif originally had golden hair but it fell out due to a trick by Loki. Ragnarok is the end for mythical Thor. In Marvel, Thor initiates and survives Ragnarok. In the Classical Norse myth, a few gods survive Ragnarok. In the Marvel universe, it appears that Ragnarok has claimed them all.